You must investigate very carefully when a financial scheme is launched. It is critical to distinguish between the genuine and fake programs. Crypto Code review, provides a thorough investigation done by experts and that helps us to choose the correct program. They check many parameters while assessing and give positive reviews to only a few genuine amazing platforms. No one can fiddle with the system and get away.And that is what was done.The initial response to von Braun’s request to surrender to the 324th Regiment Anti-Tank Company. Pictured: The just captured Werner von Bruan rocket science team. Werner von Braun is prominent with his cast broken left arm. His brother Magnus is the 3rd man to the left of Werner (without a hat) The man in a top hat between the two von Brauns is the feared and hated German staff officer responsible for the V2 rocket program, General Walter Dornberger. Toward the end of the war, most German soldiers surrendered, if possible, such as these captives guarded by a tough looking 324th Regt. soldier in the city of Ulm. As Hitler’s Third Reich was crumbling in January 1945, von Braun made plans to move his team of about 125 leading rocket scientists and engineers of the world, south to surrender to the Americans. Rather than succumb to capture by the long-sworn enemies the Russians, von Braun organized a mass exodus from Peenemunde to surrender to the American troops in Austria. 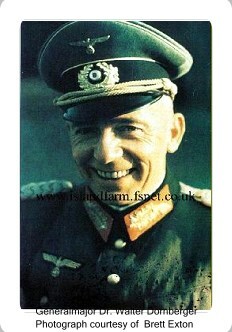 Unknown to von Braun, Hitler had ordered their execution to prevent their capture by the Allies. After a dangerous intrigue filled journey and secure in Austria, they waited for the American arrival. At that time, brother Magnus von Braun journey on a bicycle to meet them. 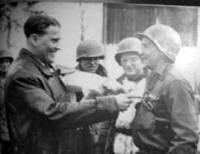 The first soldier that he met was a sentry with the 324th Infantry Regiment, 44th Infantry Division, Private First Class Frederick Schneikert. Magnus was ordered to drop the bicycle and surrender, hands-up. In poor English, Magnus tried to explain his mission. The young soldier was not really sure what think of his claims. He turned the matter over to his commanding officer, First Lieutenant Charles L. Stewart. Stewart at first thought that Magnus was trying to “sell” his brother and the other scientists to the Americans. The contemporary report from the “Mission Accomplished, The Battle History of the 44th” is written with this prospective. The communications were soon cleared up and Lieutenant Stewart gave Magnus passes for the Germans, to ensure their safe passage to the American encampment. On May 2, 1945, von Braun and his rocket team surrendered to the US 44th Infantry Division. Had the Soviets captured von Braun instead, the post WW2 history might have been far different. The V-2 is one of the most astounding weapons of WW2. A pure terror weapon and the first long range ballistic missile used in combat, it hurtled a one ton warhead 50 miles high and hundreds of miles down range to its target. No defense existed, once a V2 is launched. The V2 is the second most expensive and technically demanding of all weapon projects of the war, eclipsed only by the ‘Manhattan Project’, the American atomic bomb program. 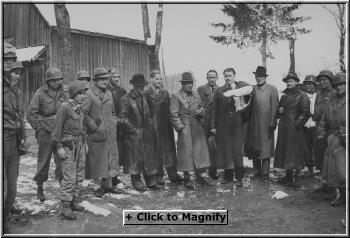 von Braun and his team successfully delivered the V2 ‘vengeance weapon’ to Hitler in 1944.